BB Battery is committed to the VRLA industry standards of exceptional quality and reliability. Where we set ourselves apart is in our combination of innovative and time-tested approaches to customer care, product development, and global marketing. The long-term commitment of B.B. Battery to the VRLA industry is the reason that we have invested and continue to invest in high tech machinery, intensive R&D and application specific product lines. It is our intention to produce ?stationary? power for a rapidly evolving world while maintaining the basics that made us what we are today. Thank you for your solid partnership with B.B. Battery and for being the driving force behind our success. 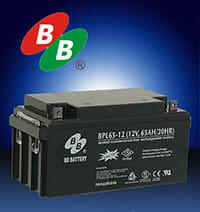 All BB batteries have been specifically developed to enhance economy of operation, reliability and energy output. The values reached in these areas position BB batteries among the very best presently available on the market. They represent the ideal solution for all applications.